Naima Samih (نعيمة سميح) was born in the Derb Essultan suburb of Casablanca, Morocco. She has been referred to as “Edith Piaf of Morocco”. 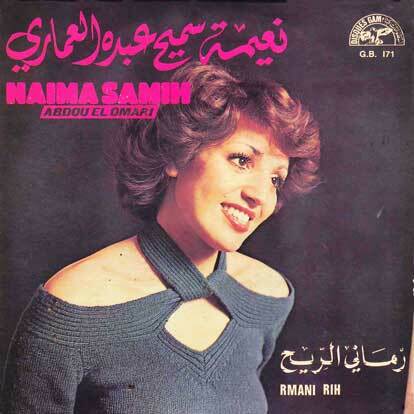 Naima Samih was one of the first female singers to gain prominence in the late Sixties and early Seventies when the field was generally limited only to men. She began singing at the age of nine, leaving school to pursue a career in music. In the early 1970s, Naima Samih participated to Abdelkader Rachdi talent show « Mawahib » winning applause from both the jury and the audience. During her career of over three decades, she has collaborated many Moroccan songwriters and composers – including Abdou el Omari. 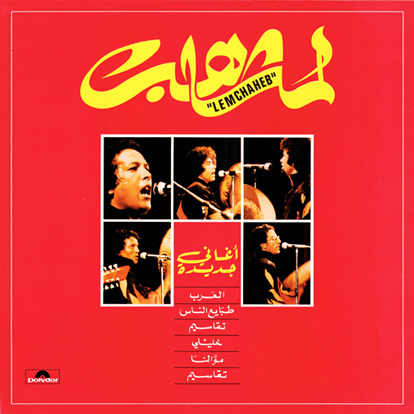 The song “Zifaf Filfada” – which was also arranged by Abdou el Omari – was included on the second volume of the Waking Up Scheherazade compilations. Catalog number GB171 on Disques Gam of Casablanca, Morocco. Released 1977. Lemchaheb was formed in Casablanca by Moulay Chérif Lamrani. Chérif had previously been a band called Sound of Today that performed Moroccan songs with Western instruments. The group was assembled by Mohamed Bakhti – who was a member of Nass El Ghiwane – and was a music teacher. He introduced Chérif to members of a band called Tyour Ghourba (Birds of Exile) from Marrakech. After trying out the names Khatou Khatou (Step) and Les Étoiles Filantes (Shooting Stars), the band finally settled on Lemchaheb – which supposedly translates as either “glowing bars on which bread is baked in the oven” or “torches that mountains inhabitants made to scare animals and keep them far from the village” – in 1973. Chérif, who had been a cartoonist, designed the groups stage outfits and concert posters. 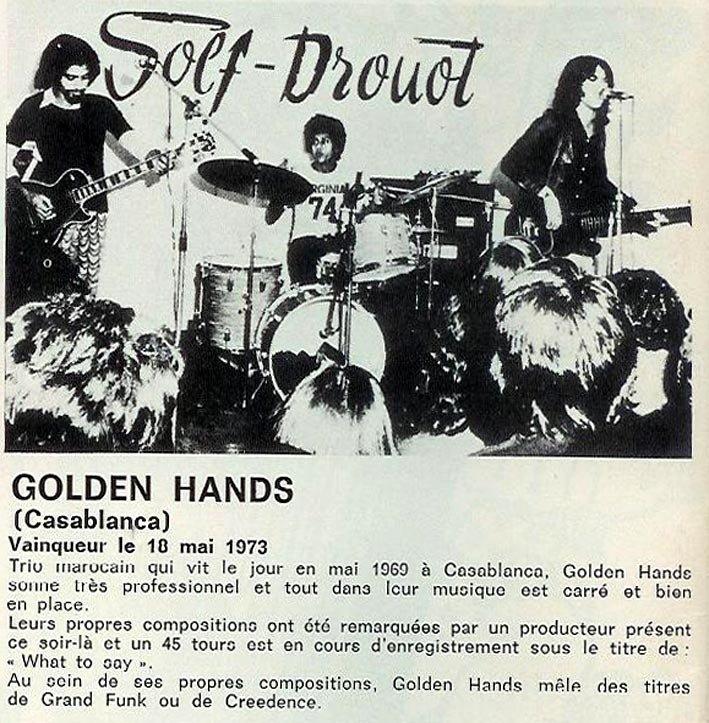 Their early tours of Europe were financed by Radiodiffusion Télévision Marocaine. The band went through many line ups, and continued performing up until 2002. 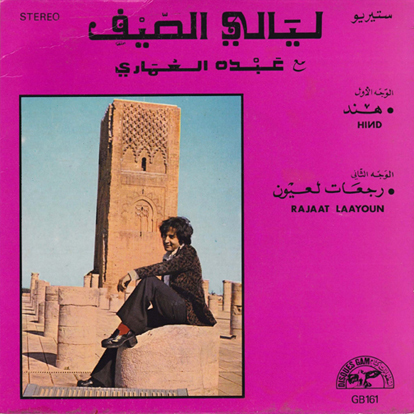 Moulay Chérif Lamrani passed away in October of 2004. These two tracks are known as “takassim” or “solo”. They are the last tracks on Side A and Side B, and are unlisted. The majority of this information came from the Lemchaheb Blogspot and a fan MySpace page. The French Colonial Empire was, at one time, a rather large chunk of territory. Over the last two centuries, The French had their hands on Algeria, Cambodia, Cameroon, Côte d’Ivoire, Chad, Dahomey (now Benin), French Guiana, French Guinea (now Guinea), French Somaliland (now Djibouti), French Sudan (now Mali), Gabon, Laos, Lebanon, Madagascar, Mauritania, Mauritius, Morocco, Niger, Quebec, Republic of the Congo, Senegal, Syria, Ubangi-Shari (now the Central African Republic), Upper Volta (now Burkina Faso) and Vietnam, as well as parts of China, India and a smattering of islands around the world, many of which still fly “les couleurs“. And even after their rule ended, the cultural influences in these countries lingered for many years after. But who would have thought there would be a Nino Ferrer (who was actually Italian, but that’s a whole other story) cover from Morocco? 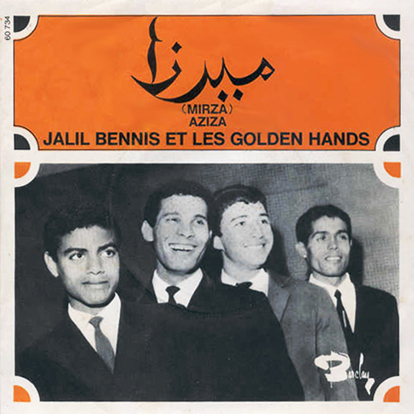 Since posting their second single, I have been contacted be a number of people (including guitarist Aziz Daou el Makane) who informed me that none of the information about The Golden Hands is correct… But when I e-mail them back, I get no response. I do know that they did work with Lester Vigon, who produced some of their recordings. And, as far as I know they recorded four singles: “Mirza” / “Aziza” on Barclay, “Promises” / “The First Time” on E.C.M. Records, “What to Say (part 1)” / “What to Say (part 2)” on Philips and “Take Me Back” / “Love Letters” on Disques GAM. If you have any further information on the band, please contact me or leave a comment. Catalog number 60734 on Barclay Records of France, released 1967. UPDATE: Apparently the band reformed in Casablanca in February, and is working on a come back. Chaabi (popular) is a music consisting of numerous varieties which are descended from the multifarious forms of Moroccan folk music. Chaabi was originally performed in markets, but is now found at any celebration or meeting. Chaabi songs typically end with a leseb, or swift rhythmic section accompanied by syncopated clapping. A sophisticated form of chaabi evolved in the 1970s competing with popular Egyptian and Lebanese music. These chaabi groups consisted of a lute and a hadjuj, with some form of drum. Eventually, new instruments like buzuks and electric guitars were added. The three most important early groups were Lemchaheb, Nass El Ghiwane and Jil Jilala. All three bands featured politicized lyrics that got the songwriters in trouble with the government. As for Jil Jdid… They were apparently based in Belgium at the time of this recording. But other than that, I have not been able to find any information. If you know anything about the band, please contact me. Catalog number ST-454501 on Atlas International of Belgium, manufacture and distribution by R. C. P. Int. No release date listed. Many Berbers call themselves some variant of the word Imazighen (singular Amazigh), meaning “free men”. This is common in Morocco, but elsewhere within the Berber homeland a local, more particular term, such as Kabyle or Chaoui, is more often used instead. The Imazighen have lived in North Africa for thousands of years, long before the Phoenicians, Romans or Arabs arrived. They’ve survived a constant stream of foreign occupation with their culture and language intact. The Imazighen are intermittently distributed from the Atlantic to the Siwa oasis, in Egypt, and from the Mediterranean to the Niger River. Between fourteen and twenty-five million live within this region, most densely in Morocco and becoming generally scarcer eastward through the rest of the Maghreb and beyond. They speak various Berber languages, which together form a branch of the Afroasiatic language family. 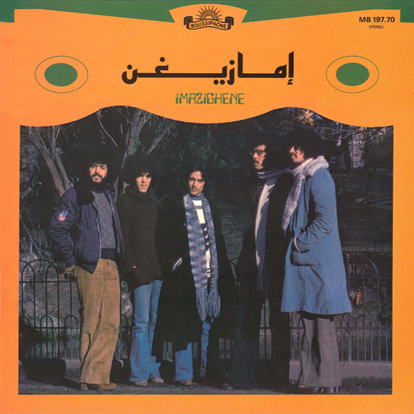 Now, for the band Imazighene… The person who sold me this record, said that they were from Algeria. But after I had asked a few people what they knew, I discovered that he must have had this band confused with the Algerian band Imazighen Imula, which was formed by Kabyle singer and political activist Ferhat Mehenni. The only clue, other than the Moroccan record label, is the text on the record itself. Apparently, only Moroccan Imazighen use Arabic lettering. Algerian Imazighen, who are more radical and against Arab culture, tend to use Latin letters or Tifinagh, or even French. What little I have been able to find out about the record label Boussiphone, is that it was founded by Saïd Boussif. The company would eventually become the production company Boussivision, which later changed its name to Tamgharet Ouragh. Thanks to Anis Bousbia and Hicham Chadly for their help. If you any information about the band, please contact me. Catalog number MB 197.70 on Boussiphone of Morocco. No other information is available. The four Megri brothers were popular session musicians / composers / producers from Morocco. There names were Hassan, Mahmoud, Jalila and Younès. Jalila was apparently a songwriter and producer, and Younès had a solo career. 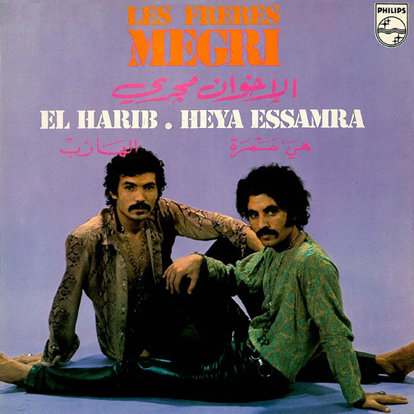 But, Hassan and Mahmoud recorded two singles singles as Les Frères Megri. During the late 1960s and early 1970s, a new form of pop music emerged in the region of North Africa. This new form resulted from the fusion of local Arabic music with European pop music. Arab media often referred to this new style as “Progressive”. In many ways, it is an independent form of music that has strong and variable Arab, African and European influences; an expression that has branched out and evolved separately from popular traditional Cha’abi music of the region. Darja, the Arabic dialect of North Africa, is often used as the lyrical language for songs in this genre. While the music is sometimes distinguishably Arabic, it is often not. The rhythms are mixtures of Berber, Arab, African and popular European, performed to the artists’ own recipe and vary to their interpretation. 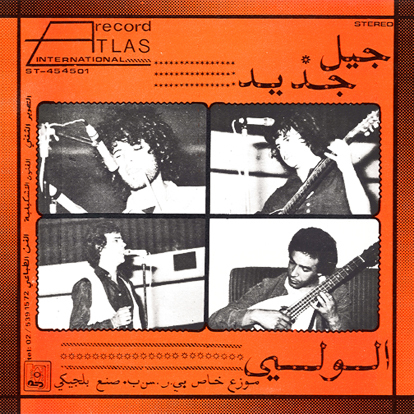 I have seen quite a few records that they have either played on or produced, but I’ve only seen two singles (with Hassan and Mahmoud) and two albums (one with Hassan, Mahmoud and Younès, and one with just Mahmoud and Younès) by ‘Les Frères Megri’. Apparently they still run a recording studio in Morocco, and Younès released an album in 2004. The majority of the information in the above post was taken from the Quarter Tone Fusion website, which you can find here. Catalog Number 6269 014 on Philips Records of France. No release date given.